Shown as a cherry hutch but available in a wide variety of hardwood options the Amish Arlington Corner Hutch is sure to impress in any wood option. 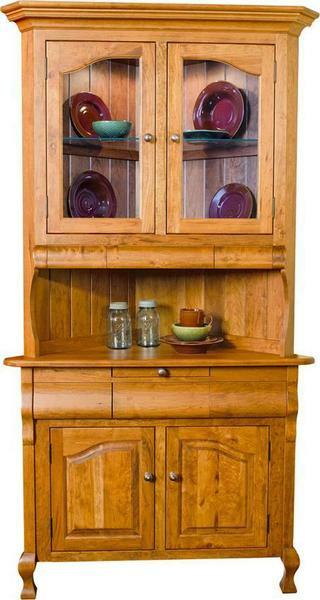 The rustic cherry wood shown in a light stain gives this American made corner hutch a more rustic furniture look. Call one of our Amish furniture specialists today to receive finish or wood samples. The Arlington Corner Hutch has unique features such as the waterfall drawer fronts, scrolled feet, raised panel sides, arched raised panel doors and shiplap back. The Arlington line is a top seller as a cherry hutch design. We also offer our Amish handcrafted Arlington Corner Buffet.